embedded world, taking place in the Nuremberg Exhibition Centre from 23rd-25th February 2016, will once again be supporting the efficiency and innovative strength of the global embedded industry. The central objectives of the conferences are to provide specifically targeted knowledge, to highlight trends and current themes, to offer a glimpse into the future and to facilitate a dialogue between experts. Electronic Specifier Editor Joe Bush takes a look at what’s on in 2016. The ‘Internet of Things’ and ‘Security & Safety’ will be the key focus at the show in 2016, and this year’s keynote speaker will be Eugene Kaspersky, CEO Kaspersky Labs. The link between theory and practice will be provided by special presentations on M2M, electronic displays and safety and security within the exhibition itself. Now in its 14th year, embedded world is once again on course to break all records. “embedded world is developing brilliantly. It is already clear that embedded world is set to be even bigger again in 2016,” said Exhibition Director Benedikt Weyerer. “The industry is still growing dramatically. For the community, the event is the most important platform for exchanging ideas and obtaining information at a high level - and the two congresses, with their innovative themes, also have a valuable role to play,” emphasised Dr Matthias Sturm, Exhibition Committee and Conference Chair, Steering Board, embedded world conference. The embedded world conference once again bears the motto ‘We are the Internet of Things’. The development of the IoT requires expertise in the core disciplines of the embedded world such as hardware and software development, systems engineering and management. Secure communication routes are also a crucial factor for the IoT. Kaspersky will underline this in his conference keynote speech. He will also highlight how IT safety aspects are also becoming increasingly relevant in the IoT in the face of the increasing fusion between IT and the embedded world. For cyber security experts, it is particularly difficult to safeguard systems that were not developed with a view to possible security attacks. Kaspersky treats the work of these experts as a type of alchemy without appropriate scientific methods. He has called for the introduction of development standards that will make software inherently more secure. For this, in his opinion, global cooperation is just as essential as the overcoming of barriers to information exchange through the ‘Balkanisation’ of the industry. After all, cyber security problems are global and can only be solved by applying global experience. In the rest of the conference programme, the security and safety of embedded systems also play a vital role. Experts from well-known companies will be presenting suitable protection solutions, describing secure transmission channels and showing how security and safety can be specifically integrated into planning and installation at various levels. Under the heading ‘Internet of Things’, all three conference days will provide answers to the most urgent questions about this second focal point of the conference. Here, the spectrum ranges from open source through the suitability of different communication protocols to best practice examples of particular IoT nodes and applications. ‘Classic’ areas such as systems, software and hardware engineering will also be included and are spotlighted in the conference programme with continuous sessions and a number of classes. Further sessions on embedded operating systems and a ‘management focus’ will round-off the broad range of themes at the embedded world conference 2016. Security & Safety for embedded systems: Securing IoT Devices, A Holistic Approach to Embedded Security, Functional Safety, Secure Software Development Lifecycle. Internet of Things: Connecting Embedded Devices, Embedded Wireless, IoT Architectures, Gateways, Testing & Solutions. Software & Systems Engineering: Requirements Engineering, Standards & Tools, Architecture & Real Time Aspects, Software Quality, Analysis, Testing & Design, AUTOSAR Beyond Automotive, Ultra Low Power, C/C++ Code - Embedded, Secure & Reliable. 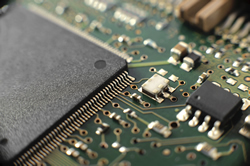 Hardware Engineering: Cortex, Multi-core, Designing with SoCs and FPGAs. Embedded OS: Embedded Linux, Android, Eclipse, Introduction to Linux-RTOS, GNU/Linux for Safety-Critical Systems. Management Focus: Agile Methods, New Business Opportunities, Open Source Software in Industrial Products. The entire programme of presentations for the embedded world conference, with contributions by international experts in 26 sessions and 15 classes, plus presentation abstracts and information about the speakers is now available online at www.embedded-world.eu. Today, the Electronic Displays Conference represents a complete digest of all the relevant information on displays for developers, users and decision makers. “Like the embedded world exhibition and conference, the electronic displays conference has also developed brilliantly. The conference has been growing steadily for years, and it will be bigger than ever for its 30th birthday. We are delighted with the amazing growth of the Electronic Displays Conference. This year, we will once again be offering participants plenty of high quality specialist presentations by international experts. “The number of first class submissions and the feedback from the industry impressively demonstrate the importance of the congress for the entire display industry. We are looking forward to the next 30 years,” added Dr. Karlheinz Blankenbach, Pforzheim University and Chair of the Congress Committee. The highlights in 2016 will include keynote presentations on new approaches in display technology and market and display trends, given by internationally recognised experts. Success factors for displays in automotive applications and the latest trends in touchscreens will be among the main themes and highlights of the conference. The programme will be rounded off by sessions on such topics as display measuring equipment, interfaces and display optimisation. The author interviews after each session also provide an opportunity to discuss the presentation in a small group. Displays are a prominent theme not just in the conference but also in the exhibition itself. The electronic displays Area in hall 1 offers a platform for the latest technology in the areas of LCD, OLED, PDP, LED, ePaper and much more. Around 60 exhibitors will be present with the latest products and systems in the field of electronic displays. As in past years, there will also be a special highlight for students. The Student Paper Award is a prize awarded for the best degree dissertation or thesis covering the subject of electronic displays. AdaCore will be exhibiting a range of software development and verification tools including several that are applicable when safety or security certification is required. The GNAT Pro Ada development environment comprises a full featured toolchain for both native and cross-compilation platforms, with support for RTOSs including Wind River’s VxWorks, SysGo’s PikeOS, and Lynx Software’s LynxOS, as well as bareboard targets. Altera, now part of Intel, will be showing a video analytics demonstration at the Intel stand (Hall 1, Stand 338). Combining video analytics technology with stereo vision technology, this demonstration shows object detection/tracking in a small, low power Altera Cyclone V SoC-based system for smart city applications such as intelligent lighting, traffic monitoring and parking monitoring. Analog Devices will introduce its latest mixed signal ‘Dual Independent Core’ control processor family, designed for next-gen high speed switching, solar PV inverters and electrical storage systems. Atollic will demonstrate its TrueSTUDIO C/C++ IDE for ARM Cortex development. The free TrueSTUDIO Lite provides edit/compile/debug functionalities with unlimited code size, and offers an optional upgrade path to a supported Pro version for developers who want advanced debugging and code analysis tools. TrueSTUDIO Pro adds features for source code reviews and static code analysis, including a MISRA-C checker and code complexity analysis, aiding improved software quality. The Pro version also adds advanced debug capabilities, including run-time error analysis, live variable watch, event/data/instruction tracing, and kernel aware RTOS debugging. 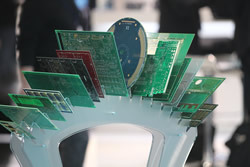 German Mixed Signal ASIC specialist Creative Chips will be represented for the first time at embedded world. The main presentation focus will be the topic, ‘Industrial application specific complete systems on a CMOS chip’. In order to support its FT51A microcontroller unit (MCU), which is now in full production, FTDI Chip has introduced an array of board levels products. The processing core of the FT51A MCU executes an 8051 feature set (capable of running at 48MHz). Along with this, it possesses a wide array of interfaces - including USB client, UART, SPI, I2C, 245 FIFO, PWM and GPIO options. IoTize from Keolabs helps eliminate costs and risks by providing configurable solutions encompassing IoT connectivity, networking and security. Using a patented co-processor and debug, serial or Modbus connections, IoTize renders machine connectivity via NFC, BLE and Wi-Fi virtually plug-and-play and transparent to the ‘iotized’ product. This means that making changing technologies (for example from Bluetooth to Wi-Fi) is much easier. PEAK-System will introduce two highlights at once on its exhibition stand - the handheld PCAN-Diag FD and the professional Windows software PCAN-Explorer 6. The PCAN-Diag FD allows the diagnosis of CAN 2.0 and CAN FD messages of a CAN bus on physical and protocol level. The PCAN-Explorer 6 appears in a new look and supports CAN-FD, so the monitoring, analysis and simulation of CAN buses succeed more easily. The latest version of PicoScope includes new and improved serial protocol decoders. In addition to popular standards such as CAN, LIN, SPI, I2C and UART/RS-232 the new release adds 1-Wire, 10- and 100-BaseT Ethernet, DMX512 (lighting systems control), DCC protocol (Digital Command & Control) and SENT (Single Ended Nibble Transmission). SENT is a point-to-point protocol that is popular for transmission of high resolution sensor data in automotive applications. Recom’s latest converter series RK/H6 and RH/H6 will be on show at embedded world. The range is suitable for a variety of low power applications in industrial electronics, measuring technology and sensor systems where high isolation voltage is particularly important. Renesas Electronics will highlight its new developments for the Renesas Synergy Platform, including the commercial release of the Renesas Synergy Software Package (SSP) version 1.0.0, mass production availability of the S7G2 Renesas Synergy Microcontrollers (MCUs), and availability of the first Verified Software Add-on (VSA) software from VSA Program partners. Rohde & Schwarz will showcase its expanding oscilloscope portfolio. Visitors to the show can get a first hand look at the new R&S Scope Rider, a handheld oscilloscope to offer the functionality and user experience of a state of the art lab oscilloscope. Silicon Labs will showcase the next wave of processing, sensing and connectivity innovations for the Internet of Things (IoT). The company will demonstrate multi-node Thread and ZigBee mesh networks, Bluetooth Smart sensors and cloud connectivity, Wi-Fi modules, multi-protocol wireless SoCs, high accuracy optical and environmental sensors, energy friendly microcontrollers (MCUs) and connected home development platforms. Swissbit AG will be exhibiting a number of new products at embedded world that address the needs of industrial, automotive and networking/communications applications. Items highlighted will include SD and microSD cards, embedded USB modules and solid state drives (SSD). The event will also signify the first appearance of Swissbit’s durabit range, which delivers a combination of performance and endurance in MLC NAND flash-based memory and storage products. The S-450 and S-450u Series SD and Micro SD memory cards will also be on show. Swissbit has added the durabit S-45 and S-45u SD memory cards for cost sensitive applications that still require high reliability. X-60m, X-60s, X-60m.2 and F-60 SSDs from the durabit range will also be featured. The SSDs in mSATA, SATA Slim, CFast and m.2 form factors achieves sequential read/write speeds of up to 520MB/s and 405MB/s respectively. Toshiba will showcase its line of 8-, 16- and 32-bit complex instruction set computer (CISC) microcontrollers. Toshiba microcontrollers are part of a total Microcontroller System Solution, supported by technical professionals ready to answer design questions, provide application support and even modify existing devices to meet growing application needs.